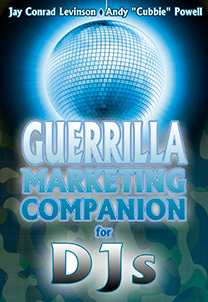 Guerrilla Marketing Companion For DJs By Andy Powell The definion of Guerrilla Marketing in this book is 'unconventional marketing intended to get maximum results using minimal resources". Based on the 4th Edition of Jay Conrad Levinson's Guerilla Marketing Series, Andy Powell has collaborated with ProDJ Publishing and Guerilla Marketing International to create a companion for the bestselling Guerilla Marketing book by Jay Conrad Levinson dedicated to the mobile DJ industry. It is packed with marketing tips and ideas for mobile DJs and illustrates the Guerilla Marketing princples using mobile DJ related examples. Although it is called a 'companion' it is actually a stand-alone, easy to read, but very informative book, that doesn't require any previous knowledge. Our payment provider is Paypal, you can use your Paypal account to pay for your Pro Mobile Bookstore order, but you do not need to have a Paypal account. You can pay using a debit or credit card using Paypal's secure payment interface. DELIVERY As long as items are in stock, your order will usually be shipped within 24 hours, however, please allow up to 5 working days for despatch and a further 3 working days for delivery. Please note, at the moment we can only despatch books to UK addresses.